A VENERABLE MUSIC ICON AND A TALENTED NEWCOMER, TOGETHER. ​​Freebo and Alice Howe present a unique study in contrasts, bringing together a venerable music icon and a talented newcomer. Each a compelling performer in their own right, they both lead and support each other in their well-crafted songs with flawless harmonies and tasteful instrumentation. Freebo is a genuine folk, rock and blues icon who, after over 40 years of recording and touring with many of the great artists of our time (Bonnie Raitt 10 years, CSN, Maria Muldaur, John Mayall, Ringo Starr, Dr. John, Neil Young, & many more) is regarded as one of the most gifted singer-songwriters of today. A multi award winner and finalist in numerous songwriting contests, Freebo was also recognized as the ‘Best Folk Artist 2007’ by the Los Angeles Music Awards. In addition, he has appeared on Saturday Night Live, The Muppet Show, The Midnight Special, and in concert with the legendary Spinal Tap. His compassionate concern for the world and people around him, as evidenced both in his lyrics and his open stage banter, has helped him connect with listeners worldwide. A musical evening with Freebo will be astute, insightful, clever, and truly melodic. With her soulful, impeccably tuned voice and crafted poetry, Boston’s Alice Howe is “at once of the moment and timeless, personal and universal” (Mark Walton, Americana UK). Her pure, distilled sound reflects a musical sensibility rooted in ’60s folk and ’70s Southern California songwriters. 2017 was the year that Alice began making big waves in the folk world. Her EP You’ve Been Away So Long debuted on the April Folk-DJ charts with a #1 song – “Homeland Blues” – and #11 album. Alice was selected as a Falcon Ridge Folk Festival Emerging Artist, an Official Showcase Artist at FAR-West Folk Alliance, and a Formal Showcase Artist at Northeast Regional Folk Alliance. 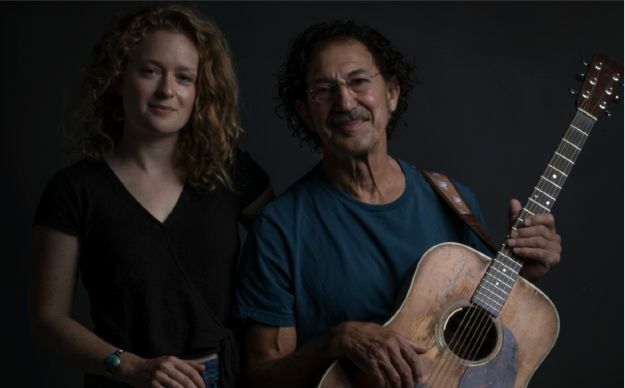 She has been touring consistently in support of her EP, playing at such venerable Northeast venues as Club Passim, Caffe Lena, and Caramoor Center for Music and the Arts. In March 2018 she appeared to rave reviews on WFMT Chicago’s iconic program “Folkstage” hosted by Rich Warren. She is currently hard at work on her first full-length album in Bakersfield, California, produced by legendary bass player turned award-winning singer-songwriter Freebo (Bonnie Raitt 10 years, CSN, Maria Muldaur, Dr. John, and many others). The release is expected in early 2019.